See My Collection And Trade! It’s been 22 months, and over 22,000 hits, and I’ve come to a conclusion I originally made in February of 2008. ‘Houston Collector’, as a blog name, simply does not do what I want it to do. It has no pop. It’s too narrow in focus, too niche when there’s so many blogs out there. Simply put, a blog this marginalized can never grow as I want it to. Don’t get me wrong, I’ve made leaps and strides in this blog, adding all of the major card companies to the list of those who send email and press releases, as well as adding Blowout Cards as a sponsor and partner, and Upper Deck as an advertising partner. I have made some wonderful contacts with the other bloggers, and we have seen many changes over the past two years. However, with the end of 2009, I have decided that it is also time to end Houston Collector. As of December 31, 2009, Houston Collector will shutter its doors, and no further posts will be made here or to the Twitter account I use. All is not lost, however, as I am proud to announce that on January 1, 2010, I will be launching Field Level View, a new blog focusing on the sportscard industry as a whole. Field Level View will feature all of the features from Houston Collector, including in-depth previews and reviews, as well as box breaks and contests from time to time. I will also be open to trading on that blog, and possibly will be doing group breaks as circumstances permit. Also, if any bloggers are interested in combining on new product breaks, I am interested in possibly doing this. Field Level View is located at http://www.fieldlevelview.com, and I hope to see everyone there in 2010! Thank you all, very much, for your continued support. News, and What’s with the Countdown? 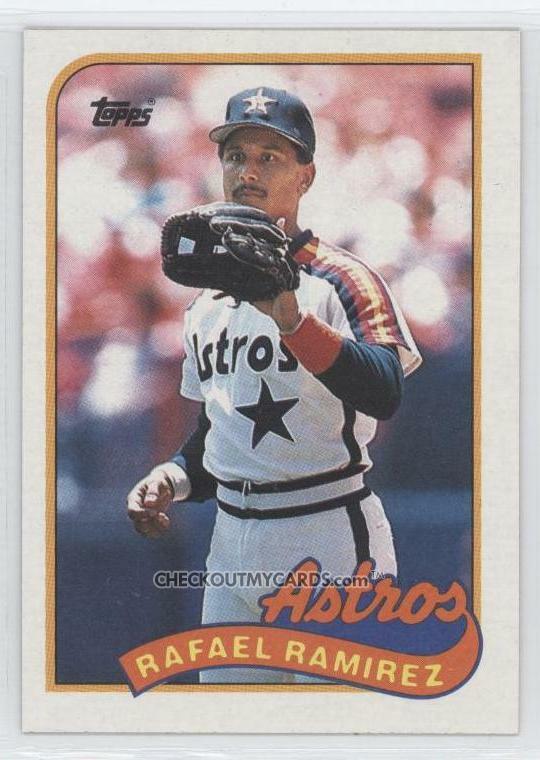 First, I would like to take a moment to welcome Upper Deck as an advertising sponsor for Houston Collector. If you look in the lower right side of your screen, you’ll see an ad for Upper Deck. I would like to thank the folks at Upper Deck for entering into this partnership, and I see good things in the future. Beyond that, there’s more coming. If you’ve been paying attention, you’ve seen a daily countdown. There’s a reason for that, and when the countdown runs out….you’ll find out. Let’s just say that some big changes are underway, and I hope that everyone will enjoy them. 2010 will be a very big year, with any luck at all. Until then, I hope everyone has a Merry Christmas or a Happy Holiday season (whichever you happen to celebrate), and may the card gods smile upon you. An Entirely New View is Coming…. 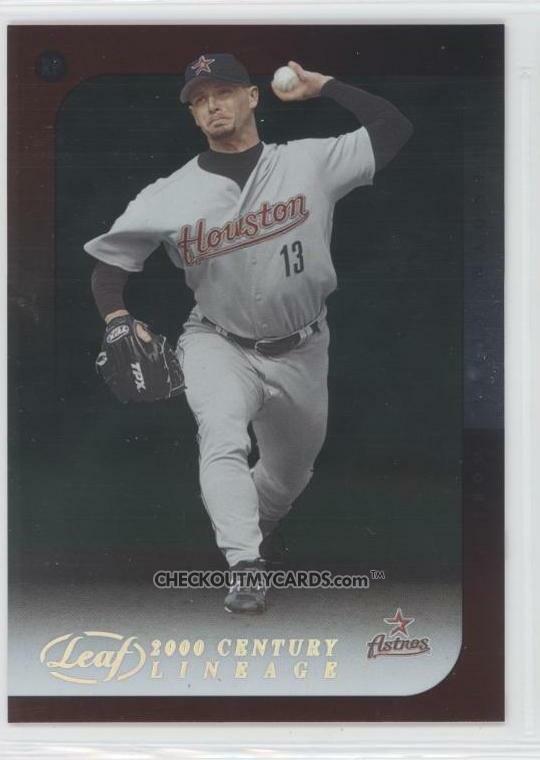 More news to follow soon…..
Last week, I was able to put up a preview of the upcoming 2010 Topps Pro Debut Series One baseball, due out in March. Today, we have a more in-depth preview, now that I have more details on the product. This product will ship in 12-box cases, with each box having 24 packs of 8 cards each. Each box will have two autographs and one relic numbered to 99 or less, with each case having three Debut Cut Signature cards as additional hits (or a 1 in 4 chance per box). Each box will also have 8 numbered parallels, falling at 1:3 packs. This will ship the week of March 15, 2010, and prices should be around $2-3 per pack, $50-60 per box and about $600 per case (granted, these are just estimates). Interestingly enough, this is a hobby-only product, so you won’t see this at Target or Wal-mart. 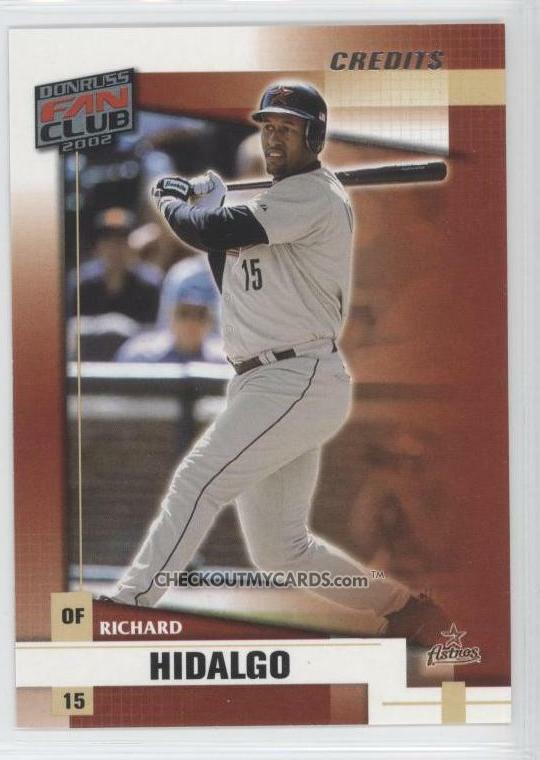 Also, I just received word that this product will not replace Bowman, which honestly isn’t that much of a surprise to me, although now I’m curious just what Bowman’ll offer in 2010. The set itself will consist of 220 players with parallels consisting of blue numbered to 199 and gold numbered to 50 and finally red numbered to 1. Printing plates, of course, are also part of the set. The autograph subset will consist of 12 cards and have the same parallels as the base cards. There are 20 players featured on the Debut Cut Autograph cards, and are numbered to 100. 49 players have relic cards, all numbered to 99 with gold versions numbered to 25. 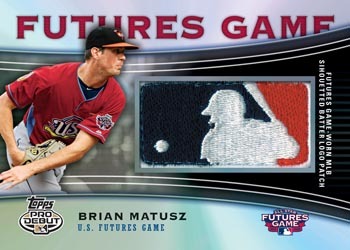 Those MLB logo patch cards seen in the preview are 1/1s of course as are the Futures Game foldout patch cards. The Futures Game red-bordered patch cards are numbered to 5 and there are also flag patch relic cards which are 1/1. Each box will feature 20 insert cards, with 30 Single A All-Stars, 30 Double A All-Stars, 30 Triple A All-Stars, and 10 Hall of Famers in minor-league uniforms. 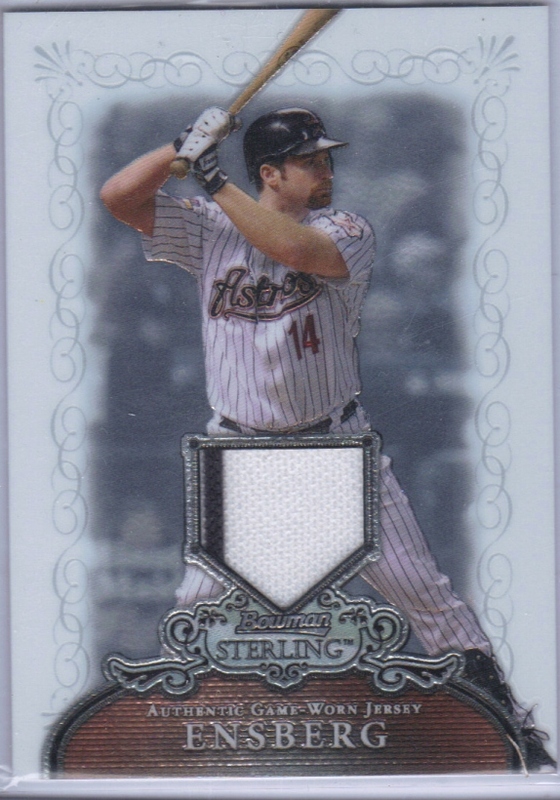 The only parallels for the inserts are going to be the printing plates, apparently. Now, looking at the checklist to see who I’m going to be collecting, I have the following in the base set: Jason Castro, Ross Seaton, Jordan Lyles, Jiovanni Mier, and possibly Barry Butera. 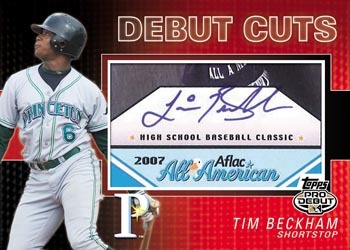 Big hits on the autos include Michael Moustakas and on the Debut Cuts you’ve got Tim Beckham, although it does appear that all of the Debut Cuts are from the AFLAC cards that Topps created back in 2007, which I’m less than fond of. However, no Astros have autographs, so I really don’t care so much about these. Relics include some pretty big names including Kyle Drabek, Madison Bumgarner, Jesus Montero, and Neftali Feliz. I’ll be wanting Jason Castro and Chia-Jen Lo, myself. None of the inserts really catch my attention, although two ex-Astros minor leaguers are in there. I don’t follow prospects much at all, to be honest, but some of the names that stand out in the base set include Cutter Dykstra, Tim Beckham, Pedro Alvarez, and probably a slew of others. Cards 201-220 are TBA also, so who knows who might be there. I’m somewhat interested in this product, but I’m less certain I’ll buy a box. We’ll see, however. 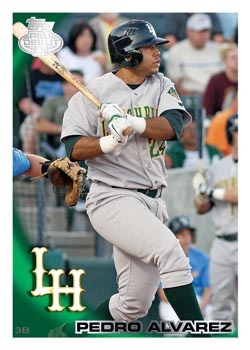 Thanks to Topps via Twitter, we have some images of 2010 Topps Pro Debut Minor League Baseball. These pictures are presumably mockups, and showing more of the hits from the product (case hits, at that, if I’m forced to guess). As we all know I really don’t like the foldout cards, so we’ll just leave that there. 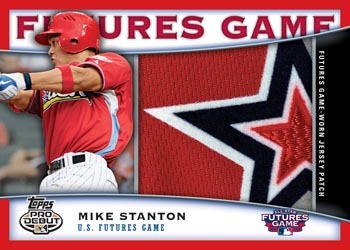 My guess is that Futures Game will be an insert in the product, and will include autograph version, relic versions, auto-relics and the patches. The autograph card of Felix Doubront is probably also the base version, which I’m actually all right with. It’s a nice picture, with the name and team information at the bottom. It’s easy to read, and the Pro Debut logo isn’t really an annoyance at all (if that’s the actual logo they’ll use for first cards). We still don’t know anything yet about the packout, checklist, or ‘hits’ per box, and I presume we’ll find this out over the next few weeks and months. 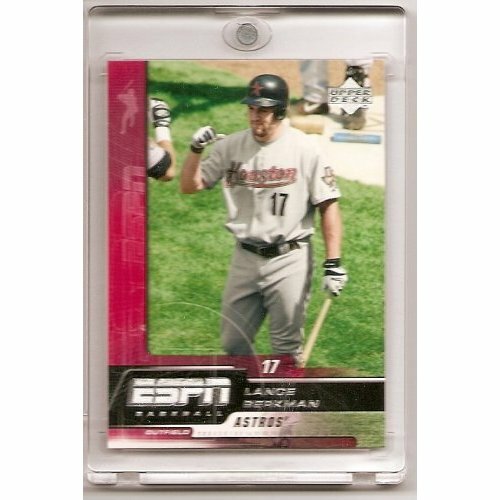 Topps Pro Debut Series 1 launches in March, 2010.